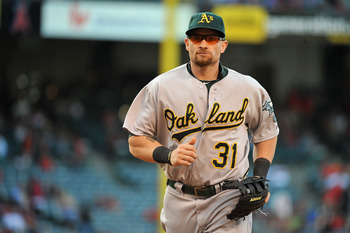 This entry was posted in Red Sox and tagged boston red sox, cody ross, David Ross, Jonny Gomes, mlb, MLB Free Agency, Oakland Athletics by tsmithbsb29. Bookmark the permalink. Overall, I like where the Red Sox are going with the signing of Gomes, John Farrell, Butterfield, etc. It shows me that they are really trying to rebuild this team into a title contender once again. Even if they lack the big names right now, these players will grow and fill roles, well if the Red Sox can capitalize on player strengths. A winning attitude is greatly needed in Boston, so I’d like to maybe see one big name player, most likely a pitcher, come in and help the Red Sox in some games this season. The resigning of David Ortiz is nice, and I hope he still has some gas in the tank to hit those home runs we all look for. Maybe one standout gold glove fielder would be a nice addition to the Red Sox. The Red Sox just need to find that new identity and become a team the fans can truly believe have a chance. I don’t know if it will happen this year, but I know Red Sox fans are pushing for a fantastic season with all of the changes.